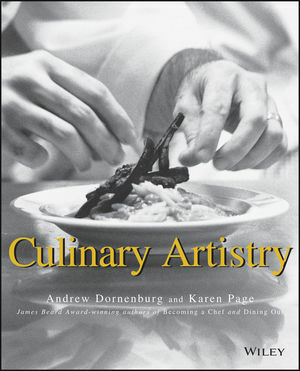 "In Culinary Artistry...Dornenburg and Page provide food and flavor pairings as a kind of steppingstone for the recipe-dependent cook...Their hope is that once you know the scales, you will be able to compose a symphony." --Molly O'Neil in The New York Times Magazine. For anyone who believes in the potential for artistry in the realm of food, Culinary Artistry is a must-read. This is the first book to examine the creative process of culinary composition as it explores the intersection of food, imagination, and taste. Through interviews with more than 30 of America's leading chefsa including Rick Bayless, Daniel Boulud, Gray Kunz, Jean-Louis Palladin, Jeremiah Tower, and Alice Watersa the authors reveal what defines "culinary artists," how and where they find their inspiration, and how they translate that vision to the plate. Through recipes and reminiscences, chefs discuss how they select and pair ingredients, and how flavors are combined into dishes, dishes into menus, and menus into bodies of work that eventually comprise their cuisines. Andrew Dornenburg and Karen Page are co-authors of a ground-breaking trilogy of books chronicling America's vibrant restaurant culture: Becoming a Chef, Culinary Artistry, and Dining Out. Becoming a Chef won the 1996 James Beard Book Award for Best Writing on food, and the couple awards an annual Becoming a Chef Scholarship with a percentage of the royalties from the book. Dornenburg has cooked professionally in some of the best restaurants on the East Coast, including Arcadia, Judson Grill, and March in New York City; and Biba and the East Coast Grill in Boston. He attended The School for American Chefs, where he studied with Madeleine Kamman. Page, the recipient of the 1997 Melitta Benz Awardá for Women's Achievement, is a graduate of the Harvard Business School (whose alumnae network she heads) and Northwestern University, which named her to the council of 100 (leading alumnae). The couple lives in New York City. Food Matches Made in Heaven. Seasoning Matches Made in Heaven. The Evolution of Leading Chefs' Cuisines.